Abi Scheid works for post position. The sophomore forward had 10 points in Sunday’s win over Illinois. Less than three minutes into Northwestern’s game against Illinois, sophomore forward Bryana Hopkins sunk a 3-pointer, bringing the Wildcats’ lead to 5-0. That shot was very telling of who would wind up dominating the Cats’ offense Sunday afternoon. 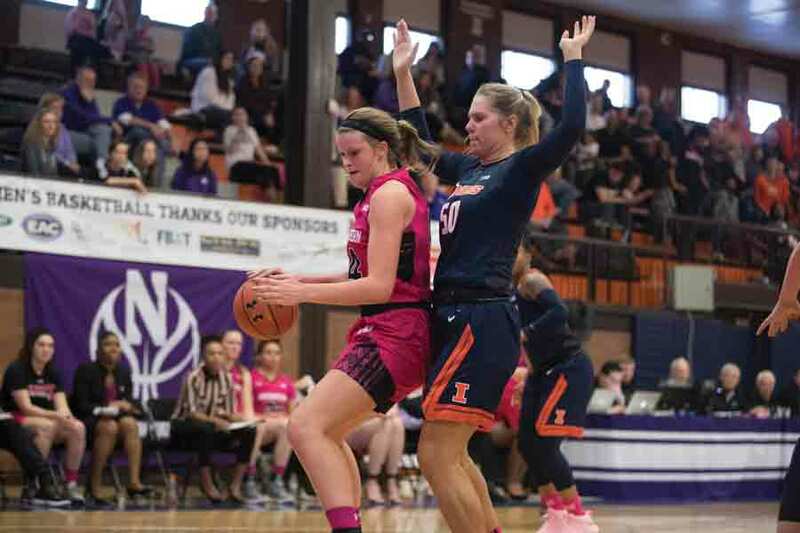 Thanks to several strong performances from typical depth players, NU (10-18, 3-11 Big Ten) came out with newfound fire to end an eight-game losing streak and get an 68-61 win against Illinois (9-19, 0-14). “I think the win is just going to be a momentum builder for us, so coming games (we need) just to remember how it feels and not want to give up,” junior forward Pallas Kunaiyi-Akpanah said. Usually, the Cats’ guards dominate the offensive effort. Three of the team’s five leading scorers are backcourt players, including leading scorer and freshman guard Lindsey Pulliam. This time, however, the roles were reversed. Pulliam and fellow freshman guard Jordan Hamilton sat at the bottom of the scoreboard, with Hamilton sinking only 2 of her 10 shots and Pulliam failing to get a point, shooting 0-for-10. With Hamilton and Pulliam off their offensive games, Hopkins stepped up and scored well above her season average of 4.6 points per game. Hopkins snagged the team 15 points this time around, making her the scoreboard leader and marking her season-high scoring wise. As a freshman, Hopkins generally rode the bench, appearing in only six games and playing no more than 10 minutes in each of them. This season, though, Hopkins has started 12 games and currently averages 21 minutes per game. Coach Joe McKeown said Hopkins is making up for her lack of freshman-year experience this season. Hopkins wasn’t alone when it came to season highs. Sophomore forward Abbie Wolf scored in the double digits for the first time this season and the first time in her Northwestern career with 10 points. McKeown said he was encouraged by the improvement showcased in Sunday’s game and is excited for the approaching Big Ten Tournament.